The lymphatic system is one of the most important parts of the human immune system, the lymphatic system fights off infections and viruses. 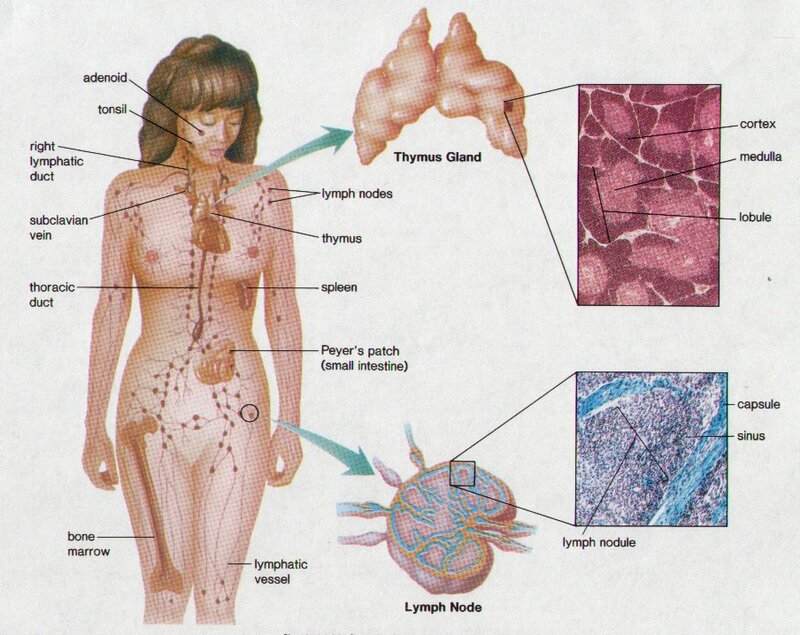 The lymphoid tissues which carry lymph are important constituents of the lymphatic system. Lymphocytes are the white blood cells of the lymphatic system. The lymphocytes along with other white blood cells form the lymph tissues. Lymphocytes are classified into 2 types, i.e. B-lymphocytes (B-cells) and T-lymphocytes (T-cells). The T-cells are known to fight off the infection of viruses. Cells infested by viruses and few other microbes are destroyed by T-cells. B-cells take care of pathogenic bacteria. The T-cells are further classified into helper T-cells and killer T-cells. The helper T-cells inform killer T-cells about an infection by producing lymphokines. This acts as a trigger for the killer T-cells to multiply and then attack the pathogens. The network or conducting system is composed of the lymph vessels, lymph capillaries, and thoracic ducts (left and right). The lymphatic system organs are the spleen, tonsils, thymus and adenoids. The main function of the lymphatic system is to remove interstitial fluids out of the lymphoid tissues in our body. However, it performs many other functions other than just removing interstitial fluids from the lymphoid tissues. The transportation of lymphocytes from bone marrow to the lymph nodes is also one of its main functions. The lymphatic system absorbs fats and fatty acids from the circulatory system. These fats are absorbed in the form of a substance called chyle. The lymphatic system is affected by diseases like lymphedema, Lymphangiosarcoma, elephantiasis, Hodgkin’s lymphoma, non-Hodgkin’s lymphoma, etc. Lymphatic flow is essential for a healthy immune system. The only way lymph fluid is moved around in the body is with muscle contraction, massage—or with Low Level Light Therapy. An average Lymphatic Treatment takes up to an hour. The major lymphatic collection points will be treated including the lymph ducts on the neck, under the collar bone, the armpit, the thymus gland, the groin and behind the knee. Additional points may be addressed at the time of your treatment. Acupoints will also be treated with the 660 laser probe. For clients who are in a state of distress 6 appointments are suggested. 3 treatments in a row, and one treatment every other day for 3 more treatments. Then monthly maintenance treatments are recommended as preventative measures. It is best to wear light weight, light colored clothing for the laser to penetrate more fully. One laser treatment is equivalent to 10 Lymphatic Massages.